He began his career as a DJ in 1978, at radio and local discos . His musical education is essentially based in music, R&B 60’s, but especially in the black music of the ‘70. Precursor of the house scene already by ‘86, and in the meantime also being fascinated by technology , engages in training to participate in DMC races ( in the ‘90, after winning selection in the south, enters the finals, taking part in 1991) . The great adventure in the record industry began by the project “Pep-Pill” with “Rhytmistic EP”. 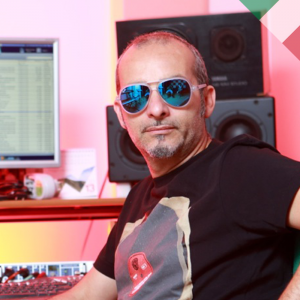 Subsequently, his passion for the DJing led him to undertake a collaboration with the rap formation Nuovi Briganti, with which he created the singles ‘U cchiu’ beddu suli “and” Ciuri ciuri “. Brings on its label “Polydor” its first LP “Fottuto Terrone”, With them, Nick “officially” opens the performance of Public Enemy in Prato, and the Beastie Boys in Reggio Emilia in 1993, more than fifty concerts around Italy and a tour in Belgium . From 1994 to 1999, his production activity intensified remarkably with a series of releases of extreme artistic thickness. For him, the collaboration with his friend Jamie Lewis (DJ / producer and manager of Purple Music / Purple Traxx) is fundamental, with which he is the project “Delicious Inc.” . Their partnership produces hits such as “Sunshine Hotel”, “Eau De ‘Chante” “” Catch The Funk “, still used and remembered by all DJs on the world stage scene. The breakthrough comes in 1999 when, together with Dino Maggiorana, is the project “Phunk Investigation”, from which the remix of “Flawless” (track electro of the English group “The Ones”) is born, which sticks to the honors of the discography Reaching the 7th position in the UK Charts. In the meantime, he began a wonderful collaboration with Jim Kerr of Simple Minds that will lead in some singles and a CD which contains 3 tracks where in is author , (including “Cry” and “Space Face” . In 2003 closes the parenthesis with Phunk Investigation. Then, In 2004 with Daniele Tignino, Nick comes with “TML ft . Belle” and the track “Have a Good Time”. From 2008, the artistic partnership between Nello, and David La Maestra (Dave Scott), has gone through a process set to a growing line of artistic and technical, which led them to a number of interesting targets as the foundation, together DJ Massimo Previti, the Dabit Records label, which the same Massimo held the position of “owner manager”. It includes among its releases, all made of double support vinyl / mp3 (reflecting the deliberately high quality shooting) artists of the deep / garage / tech scene really quoted COEO, Alkalino and JackFellDown, who have guaranteed an artistic thrust definitely appreciated by industry discography, according to the intentions of the founders. Not only. Eager to be able to create their works in a suitable location for their needs, Nello and Dave realize the Soundfactory Studio, designed not only as a production studio for its own sake, but also as a focal point for young (and old) who want look out to the disciplines of production and other activities’ related to it. Through the professional skills of the same, (which, for this purpose and for his personal training and dedicated to a thorough study of the technical process of evolution of the record production of recent years) the hotel offers activities’ specific learning on the “mix” techniques, “mastering”, “DJing” etc. The activity of study and’ also served to implement the exchange and cultural sharing of the territorial area of residence will also allow local producers and DJs to interact with each other in a more ‘profitable. In fact, inside, Nello and David also offer the opportunity ‘to build finished products for third parties, examining demos, perfecting mixes and arrangements, and possibly setting up collaborations record for the ideas proposed.